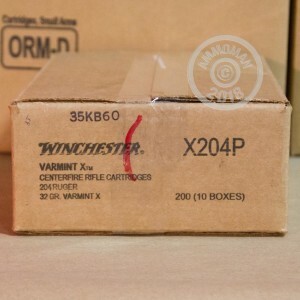 Cross off vermin with this Varmint-X ammunition, which is designed to dispatch coyotes, groundhogs, squirrels, and other pests with ease. 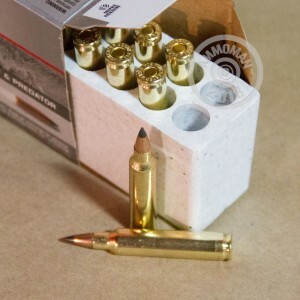 Each .204 Ruger cartridge in this box of 20 fires a light 32 grain projectile at 4,000 feet per second, producing rapid fragmentation and a quick kill without overpenetration. 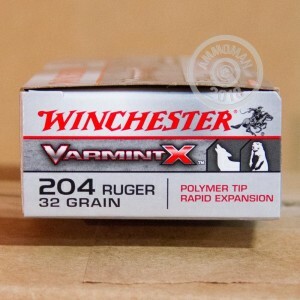 The .204 Ruger cartridge was developed by Sturm Ruger and Hornady specifically for small game/varmint hunting. It is a flat-shooting, precise cartridge suitable for chambering in AR-15s and other rifles. Order today at AmmoMan.com to enjoy free shipping on all orders over $99!